The iconic crossing of Hollywood and Vine calls out to tourists the world over, unless that's actually just Hasselhoff, mumblingly pleading with passers-by to look at his Walk of Fame star. For a non-crazy but still-loved-by-Germans Hollywood and Vine draw, check out The Redbury. 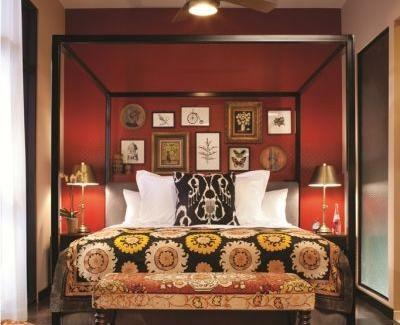 Curated by a world-renowned celeb/fashion photographer, The Red's lux hospitality group SBE's fifth foray into the hotel biz: a jewel decked out with vintage art and photography, wood paneling, and rare bronze mirrored walls, perfect for asking "who's the bronzest of them all? ", to which they'll always reply "George Hamilton". For sleeping, they've got 57 uniquely appointed flats (ranging from 750-1020 sqft) with a "Bohemian counter-culture feel", achieved via walk-in rain showers, vintage rock posters, vinyl collections and turntables, amidst which to enjoy optional in-flat yoga or Pilates services, unless you're Al Gore, in which case such services must be performed in a public place and only during the daytime. For eating, their Mediterranean-themed Cleo's got casual and surprisingly affordable grub including traditional Mezes (baba ganoush, dolmades, hummus), and more varied options such as raw oysters & ceviche, and Hanger Steak with masami, spoon salad, & grilled PeeWee potatoes, who are hopefully only interested in pleasuring your taste buds. To keep you relaxed while working and/or avoiding working, they've got a heavily landscaped, teak wood floored central courtyard and event space, though clearly the main event's out on the street, probably covered in hamburger.